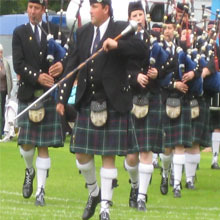 The annual Strathpeffer Highland Gathering, one of the longest-established Highland Games in Scotland, takes place in the grounds of Castle Leod every August. The first Strathpeffer Games for which records are available took place on Wednesday 20th July 1881. It was noted that some six professional athletes took part (including two from Inverness) supported by amateurs from Bonar Bridge, Munlochy, Dingwall and elsewhere. Whilst Games took place in 1881, the following year appears to have marked the inaugural Strathpeffer Highland Gathering under the direction of a committee formed to encourage Highland sports within the district. Hence, we consider 1882 to be the true birth of our Games.